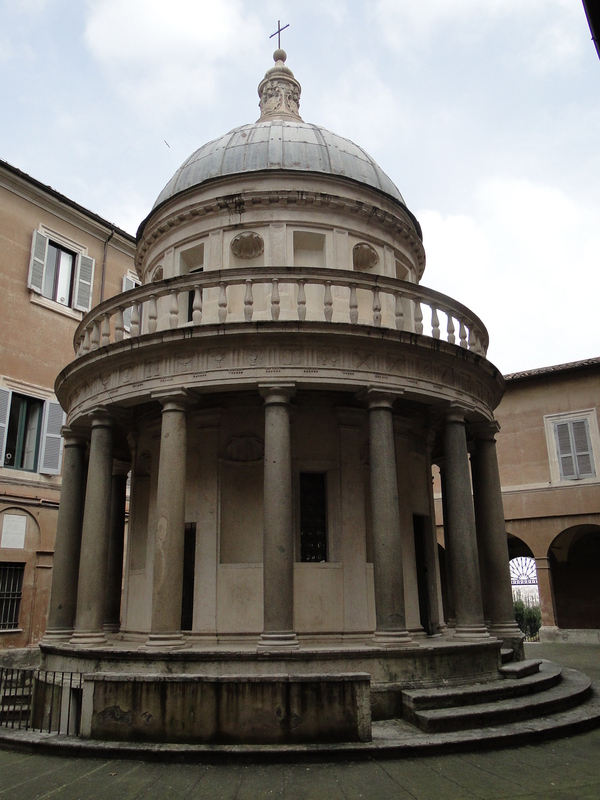 Hidden in the small cloister of St Pietro in Montorio on the Janiculum hill, Bramante’s Tempietto (little temple) is considered as the High-Renaissance masterpiece encompassing all the ideals and ideas of the time. Today, it is overshadowed by the many majestic churches and buildings in the city, but when newly built in 1502, it was much admired by the many artists who worked on the construction of Rome. They used it as an architectural model and reference point all the way to the Baroque age. Looking at the temple, one can see for instance, how it inspired Bernini’s colonnade at St Peter’s square. Where Bramante had columns intimately encircling the temple, Bernini opened them on to the outside as a way of inviting the souls into what was seen as the greatest church. Where Bramante built a temple with human dimensions, Bernini expressed all the excesses of the Baroque age. Yet Bernini’s idea of a series of columns surmounted by a balustrade is close to Bramante’s design. The small Tempietto seems surprisingly out of proportion for the church’s courtyard, probably because the latter was added later. In his original design, Bramante had planned a circular cloister to reflect the design of the temple, but this was not completed. The church itself was commissioned towards the end of the 15th century by King Ferdinand and Queen Isabella of Spain to replace an earlier Middle Age church built to mark the spot where Peter’s crucifixion was believed to have taken place. It was consecrated in 1500 under Pope Alexander VI (Borgia). The Tempietto was added to commemorate St Peter’s martyr. Donato Bramante was the artist and architect who brought the Renaissance to Rome at the turn of the 16th century. A contemporary of Leonardo da Vinci, he was originally from the central Marche region, but went to Milan in 1474 at the age of 30, to work for the Duke of Milan Ludovico Sforza. Ludovico il Moro, as he was also called, was a great patron, surrounding himself with the best artists and musicians of the time. He was the one who commissioned Leonardo da Vinci to paint his famous fresco of the Last Supper in the church of Santa Maria delle Grazie. At the same time, Bramante worked on the design of the church’s cloister. However, he caught the Duke’s attention with his trompe-l’oeil prospective, one of the first in the history of art, in the tiny church of Santa Maria presso San Satiro near the piazza del Duomo. The church was too narrow to add an abside, so Bramante created a false one through a painted prospective, which gives the illusion of a depth of about six to eight metres, instead of one metre as it actually is. On his arrival in Rome, Bramante was quickly noticed by Cardinal Giuliano della Rovere, future Pope Julius II, who upon his election in 1503, was to appoint him chief architect at the Vatican. 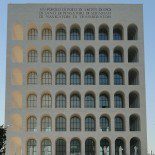 In that position, Bramante worked closely with his protégé Raffaello on the new rooms and wing in the Apostolic Palace, while his rival Michelangelo started working on the Sistine chapel. He was replaced by Antonio da Sangallo on his death in 1514. Although he was also an accomplished painter, Bramante is remembered mainly as an architect. This entry was posted on April 14, 2011 by Salambo in Arts and culture, churches, English, Renaissance Rome, Roman artists and tagged bramante, italy, leonardo, Michelangelo, Roma, Rome, san pietro in montorio, santa maria presso san satiro, tempietto, Vatican.